One of the best things about being pregnant, besides the fact you’ll have a baby at the end of it, is the fact you don’t need to worry about mother nature! The nine month break from having a period is definitely a major advantage of pregnancy. The trouble is, after giving birth, it’s only a matter of time until your period makes a reappearance. After going nine months without one, it’s easy to get caught out by the return of your monthly cycle. It’s also possible that first period won’t quite be like the ones you used to have. 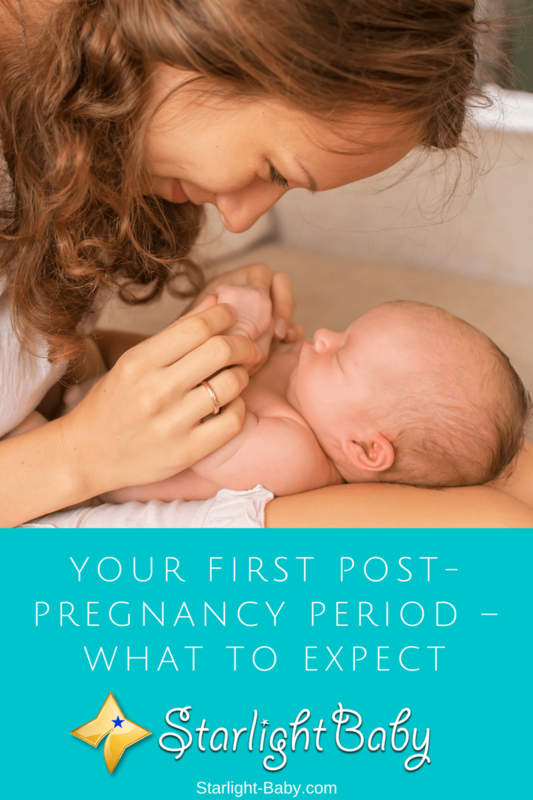 So, to help you prepare, here you’ll discover everything you need to know about your first post-pregnancy period. The time you get your first post-pregnancy period will depend upon whether or not you are exclusively breastfeeding your baby. If you are, you can expect to get your period around six to eight months after giving birth. If you’re not breastfeeding, it could return as soon as just four weeks after giving birth. The reason breastfeeding moms don’t tend to get their first post-pregnancy period for up to eight months, is because of the Prolactin hormone. This is required by the body to produce breastmilk, and it suppresses your reproductive hormones. So, you won’t release an egg or ovulate while you’re breastfeeding. Some mothers even find they don’t get a period throughout the entire duration of breastfeeding. It’s worth noting that if your period does start fairly quickly after giving birth, your doctor may advise against using tampons. This is because they could lead to trauma, so if you do use them, it’s always worth checking with the doctor to see when you can return to using them. It’s also important to note that bleeding and spotting is common a few days after giving birth, but it’s not actually a period. Is It Possible To Get Pregnant Again Before It Arrives? As many women have learnt the hard way, it’s absolutely possible to get pregnant before your first post-pregnancy period turns up. However, if you are breastfeeding exclusive, this does tend to act as a natural contraceptive. Just remember, like most forms of contraception, this isn’t 100% guaranteed to work. The reason it’s possible to get pregnant before your period returns, is because the body ovulates before it menstruates. This means you’ll already be fertile before your period makes an appearance. Some women have even discovered they are pregnant again at their six-week postpartum appointment! So, if you don’t want to get caught out, it’s vital you use some form of protection. Make sure you speak to your doctor or pediatrician prior to starting any form of birth control. Some of them aren’t suitable for nursing mothers so you’ll need to discover which one is right for you. What Will The First Post-Pregnancy Period Be Like? Now, some women will experience less pain and lighter cramps than usual, but the majority tend to suffer at least one of the symptoms listed above. Can It Affect Your Breastmilk? It is possible the return of your period could affect your breastmilk. This is down to the hormone changes which occur in the body. It could impact how the milk tastes and how baby reacts to it for example. You may also notice that your milk supply slows down. However, any changes which do occur are usually very minor and they shouldn’t have an impact on your ability to breastfeed. Why Are Post-Pregnancy Periods Sometimes More Painful? In many cases, new moms often discover their post-pregnancy periods are more painful than they were before, especially the very first one. There are numerous reasons for this including the fact your uterine cavity can become larger once you’ve given birth. This means, you’ll have a lot more uterine lining to shed. After not having a period for over nine months, your first post-pregnancy period is also likely to be a lot heavier. As the cramps can be a lot more intense, this also causes pain levels to increase. Or, they could become more painful temporarily due to the hormones produced while you’re breastfeeding. While it’s impossible to tell exactly what your first post-pregnancy period will be like, there are some symptoms to watch out for. If you notice any of the symptoms below, you should contact your doctor just to be on the safe side. Extremely Heavy Bleeding – If your pads are soaking through after just an hour, this isn’t normal. Foul-Scented Discharge – If you notice a foul odor and there’s discharge present, you’ll want to get it checked out. Bleeding For More Than 7 Days – Although your first post-pregnancy period can last longer than usual, you shouldn’t be bleeding heavily for more than 7 days. Large Blood Clots – Larger blood clots are a common symptom of the first post-pregnancy period. However, they shouldn’t be larger than a softball. Pain While Urinating – You shouldn’t experience any pain when urinating during your period. Other Unusual Symptoms – If you notice you have a severe headache, a sudden fever, a sudden intense pain or trouble breathing, you’ll want to contact a doctor as soon as possible. These are the main symptoms to watch out for. Of course, if there’s anything you’re concerned about you should seek advice from your doctor as soon as possible. It’s likely there isn’t a serious problem, but it’s still worth getting checked out. The return of your period can be a nasty surprise and there’s no way of telling how severe it might be. Remember to stock up on plenty of pain medication (if you aren’t breastfeeding) and some additional pads just in case it is a lot heavier. This article contains two interesting points that I always wanted to know. When does the period come back? Is it possible to get pregnant before the period? I found it interesting that these two issues are actually associated with whether you are breast feeding or not. Thank you very much for useful and interesting artice. Hi, vinaya. Experts say the period comes back in five to six weeks after delivery if the mother does not purely breastfeed. For those who breastfeed exclusively, it depends, but will surely take longer to come back because breastfeeding prevents the production of reproductive hormones. Here’s the link for more on this: https://www.healthline.com/health/pregnancy/first-period-postpartum#when-will-it-return? Im currently pregnant for my 1st baby. Everything here will certainly help me in this pregnancy. Congratulations on your first pregnancy. The truth is that being a part of this site has really helped me to learn lots of things as regards childbirth and how to become a better parent. One thing that I am going to advise you is for you to always read through lots of other articles that are on the website for it is going to be helpful in the long-run. Please feel free to read our other articles. We truly hope we could help you become a better parent with articles like this. With nursing moms understanding everything that has to do with post birth period, I feel there is no much to worry about when they notice some of these symptoms listed above. The reality is that they have to see the need to talk to the doctors should any complications arise, so that they know to do. You’re right. If moms are well-equipped with information such as this, we do not need to worry much 🙂 And yes, they should seek immediate medical attention if they suspect something is wrong.